This beautiful resort overlooks the deep blue waters of the Aegean Sea from its commanding position above famed Elia Beach. 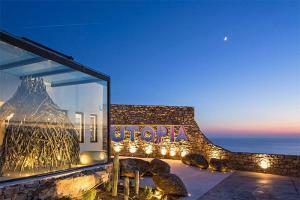 Combining the breathtaking magnificence of unspoiled nature with the sophistication of contemporary design, Utopia stands out as the pinnacle of exclusive, tailor-made hospitality on the island of Mykonos. Experience flawless facilities, impeccable personalized services, luxurious thalassotherapy spa treatments and gourmet dining options at this sanctuary for the senses. Located just 6 miles from the Mykonos Island National Airport. Agios Sostis Beach, Archaeological site of Delos, Little Venice, Panormos Beach, Elia Beach.